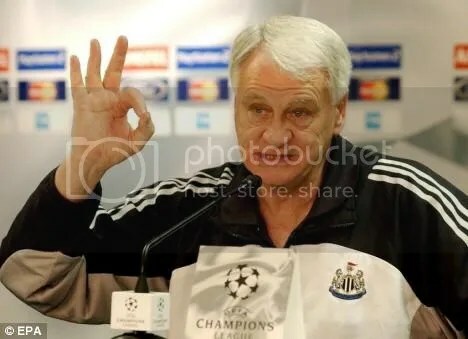 Sir Bobby Robson – The Black and White Knight – Move. Run. Sports. I wrote this a few days after Sir Bobby passed away and thought it should be on my blog. RIP Sir Bobby. Sir Bobby Robson really was a saviour to Newcastle United and helped me find my passion for Newcastle United. In September 1999, Sir Bobby was to return home where he belonged and to his dream job. The one he had always wanted, managing his home town club. The day he was unveiled as manager almost 10 years ago now, fans flocked to St James’ Park and yes I was one of them. I am in the top left with the black and white shirt on, and arms in the air. As I can remember nearly falling off the white hand rail as I was trying to see. I was 12 years old and had been supporting Newcastle for years by then. But it wasn’t until Sir Bobby that I really became a fan, I managed to get tickets during his era and I really was hooked. Back then if we went a goal down, it did not matter everyone knew we could still win the game. I lost count of how many games we went down 1 nil and I left the stadium happy with a 2-1 win. (This changed after Bobby left). 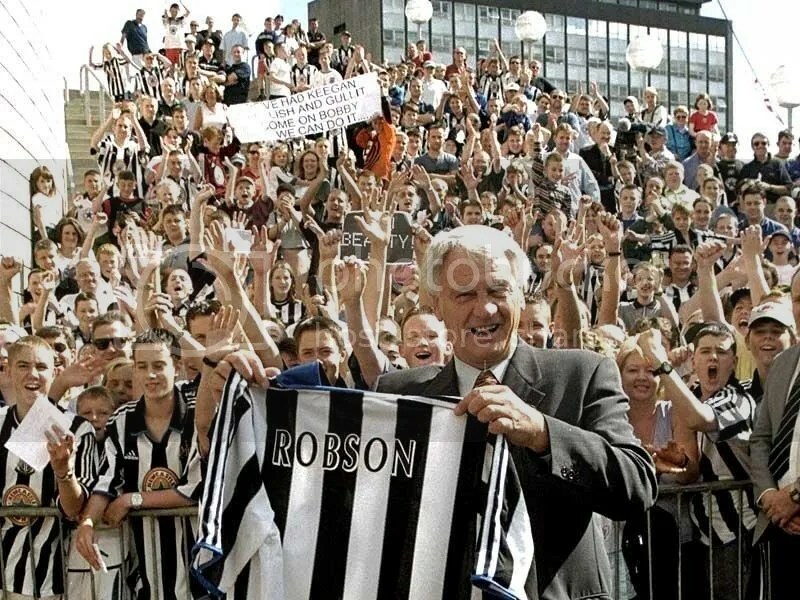 Being there the day Bobby was unveiled was the first big event I went to in relation to Newcastle United and has therefore always been something that I have remembered and talked about to this day. His passing has been extremely difficult, as I have not been able to go to St James Park and pay my respects. I was also not able to attend the charity game in his honour. I thought it would be a little easier to put this down in words, but it really isn’t. In a brief sentence he really changed my life, which is a bold statement to make but he really made me fall even more in love with football than I was before. He came at the right time for Newcastle, we were bottom of the league and in his first home game in charge we beat Sheffield Wednesday 8 nil at St James Park! What a way to turn everything around in the 1999/2000 season we finished in 11th place which was a dream after the awful start we had before Bobby came and saved us from the unthinkable. 2001/02 season we finished 4th and headed for the dream . . . champions league. The best competition in Europe, and what an adventure we had. Playing against Barcelona, Inter Milan and I will never forget that Feeynood game “Bellammmmy, has there ever been a more dramatic night in the champions league!” Newcastle never have been a team to make it boring, real entertainment and nail biting action. Seeing Sir Bobby dance on the touch line when a goal went in was just priceless. 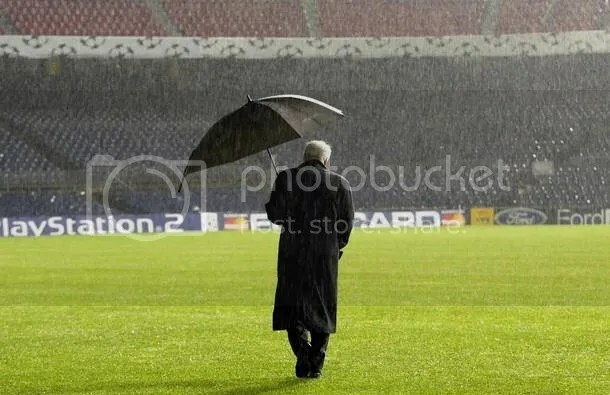 A rainy day in Barca, when the game got put back 24 hours. The next day at the game chants of “we’re getting sacked in the morning” rang out from the Geordie faithful who stayed the extra day to see the game. The interviews he used to do were just fantastic, with some incredible quotes. One of my very favorites is when he is talking about having wild dreams, and the reporter mentions the moon, Bobby responds with to the moon? . 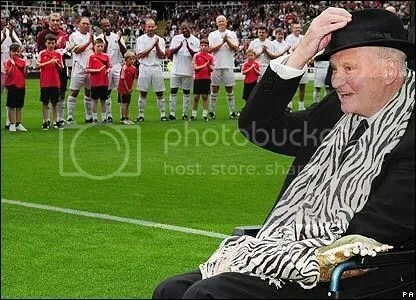 . . .. . .
After having to watch clips of the Charity match (was so disappointed I could not be there) I downloaded Nessun Dorma by Tenors Unlimited and all I can think about when I listen to it is the image of Sir Bobby sitting in the wheelchair with his hat on, waving to the crowd and moving slowly to the music. I think that image will be there every time I listen to this version of the song. He looked so sad, but so happy at the same time. In what turned out to be his very last public appearance, he still had a smile on his face, and eventually saw England beat Germany. Seeing him sitting in the chair really did break my heart, its so difficult to see someone like Bobby being such a shadow of him former self. I still remember him jumping/dancing on the touch line in a champions league game. I really loved how he celebrated the goals we scored, it just showed how much he cared and how much it all meant to him. Not like anyone would ever have doubted Bobby. Also his enthusiasm for encouraging the players, he rarely just sat down and watched. He stood in his technical area which I found just fantastic. He really was one of a kind, no one will ever come close to him. He was always so full of life and just loved football. And thanks to Sir Bobby I love football more than anything.